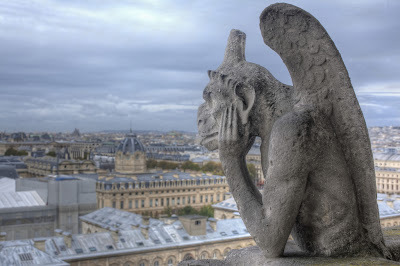 I know that feeling, Bored Parisian Gargoyle. I haven't seen anything interesting lately either. I've been experiencing some serious genre ennui lately. With one or two exceptions, none of the new science fiction and fantasy television, films, or novels are particularly riveting lately. The new Doctor Who companion? Overly twee. The Great and Powerful Oz? Snoozefest. The latest selection of eBooks at the library? Pathetic. So, what's a girl supposed to squee about when nothing thrills her anymore? Well, that's where I was hoping you'd come in, boys and girls. What new movies, books, and tv shows have you in a tizzy lately? What have you been enjoying that I'm missing out on? Save me from the Doldrums, please! Frank Tuttle (just about anything he writes. Markhat series is my fav, but the All the Paths of Shadow is good too). You know, I think I have Blade Song on my Nook already. I'll have to dig it out and I add the other two to my list! You know I have a list. :D Here's some mysteries, since they are a little different from the usual SFF, but aren't a Lifetime or Hallmark movie (cause I can't help you there). Did you ever read the Pendergast books by Preston & Child? I need to re-read book 1, Relic (that was made into a movie in the late 90s/early 00s; book was better) and others in the series. If you want to go medieval on those doldrums, did you ever read the Cadfael or Sister Fidelma mysteries? I read a couple after I saw the Cadfaels on PBS's Mystery (starring Derek Jacobi). Quick and def different from the usual SFF. I kind of liked the medieval village setting. My Bookish Ways raved about Three Graves Full by Jamie Mason - I just got it from the library. Oooo. Medieval could be good! I haven't even heard of the Pendergrast books either. I'll look those up and Three Graves Full, too! Seconding the Sister Fidelma mysteries. I adore them! I have been going through the same. Wool by Hugh Howey has my attention now.